by Courtney E. Martin «» …Working families in the United States have many struggles today: expensive child care, not enough time to cook healthy meals, disconnection from nature, a sense of social isolation — what the sociologist Robert Putnam famously called “bowling alone” — and more. Older Americans, a booming population, often end up segregated generationally and in dire need of care and companionship. by Sally Abrahms «» … three housing options let you age in place and preserve your independence. 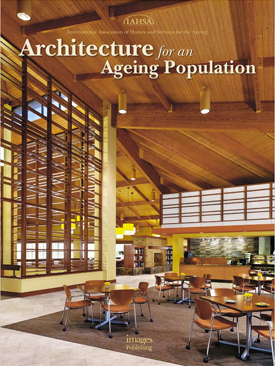 A compilation of drawings and photographs from a variety of projects to illustrate the art and science of design for spaces used primarily by older people, assembled in a handsome large-format book. by Charles Montgomery «» Rob McDowell lived in a hip, luxury condo with a sweeping view of Vancouver, but he was miserable. A move within the same exact building complex changed everything about his life--and should change how we design our cities.… Fast CoExist article. by Diane Margolis and David Entin «» In 2010, the Board of the Cohousing Association of the United States began a three-phase research project to better serve its existing constituency, assist those wishing to form new communities, and promote the value of cohousing. This report describes the first phase, an extensive survey to gain more information about existing cohousing communities, and a second phase of three open-ended questions… Survey of Cohousing Communities 2011.
by Duane Elgin «» What does a thriving way of life look like in a post consumerist society? Many aspects of a thriving future can be found by stepping into a contemporary co-housing community or eco-village … Huffington Post article. updated September 11, 2011 Who are cohousers, anyway? by Rebecca Lane «» Do your friends and family ask you this question? I get it all the time. Who are these (fill in the blank) progressive, risk-taker, entrepreneurial, edgy, idealistic, wild bunch of people, anyway?? To begin answering this question, the Board of Coho/US completed a survey of 80 cohousing communities and their residents. Here is some of what was found… CoHo/US survey. by Dan Reed «» New research shows that a growing number of homebuyers are interested in walkable, transit-served communities, and are willing to sacrifice a bigger house for a better neighborhood. Last night, Joe Molinaro, director of Smart Growth and Housing Opportunity at the National Association of Realtors, and Shyam Kannan, director of research at real estate consultancy RCLCO, gave a talk on “Polls, Demographics and Demand for Smart Growth” hosted by the Coalition for Smarter Growth at the National Capital Planning Commission… CoHo/US on What homebuyers want. …just as important as the use of sustainable materials are the social aspects of cohousing: the placement of cohousing communities within existing neighborhoods, the sharing of resources, and the positive group education around sustainability. This type of development brings social benefits —being close to friends and neighbors— as well as reduced consumption, all of which make cohousing a more sustainable lifestyle… Creating Cohousing excerpt. by Daniel DeBolt «» With a few changes to city codes, the City Council is encouraging historic preservation and potentially saving the 19 households of the city's first co-housing project as much as $674,000 in fees.… Mountain View Voice. by Leon	Kaye «» Modern US attitudes towards community have been affected by the way we build our homes but co-housing, which shares space and resources, is challenging that… Guardian on Sustainable Communities. by Jeff Carr «» Designing one’s dream home is a lengthy process when 13 families have to agree on everything. So how does the Mountain View Cohousing Community expedite the process? Find six more families.… Mountain View Voice. Residents hope to occupy new homes by fall 2013… Palo Alto Online. by Cody Kraatz «» Kate Forrest wanted connection, a place to live out the rest of her life in one place and live it sustainably. She found all that and more in Mountain View Cohousing, an ambitious 19-unit development … Man on the Earth article. Three Palo Alto households … were delighted Tuesday night when Mountain View City Council approved 7-0 our application to build a new cohousing project. We’ve planned it, designed it, and now we’ll get to live in it!… Palo Alto on Line article. by Katherine Forrest «» Local residents are in the process of planning for a new “old-fashioned neighborhood” on a piece of property at Calderon and Velarde. This is a “first” for Mountain View, and it represents part of a growing interest in cohousing nationwide… Old Mountain View Neighborhood Association. by Jules Rogers «» … A four-story contemporary condominium building is going up along Southeast Belmont Street with a unique twist on who is doing the developing. “The thing that's so different about this project is it’s being built by the people who are going to live in it,” said project founder Jim Swenson. … Portland Business Tribune. October 2014 Why Not Commons? … Located on Walnut Avenue and Center Street downtown, Walnut Commons broke ground in March of 2013, and was completed this summer. At this point, all of the units have been purchased and the residents have started moving in … Santa Cruz Good Times Weekly. by Madden Yee «» … The urge to be part of some kind of clan is an ancient one, wired into our DNA. For me and my husband, cohousing —folks deliberately choosing to live together in a neighborhood they’ve created— scratches that itch. In the late 1990s, when some members of our church invited us to join a cohousing project they were developing in North Oakland, we jumped at the chance. It seemed a great opportunity to care for the planet through sharing resources like cars and tools, to offer each other support as we raised children, and to contribute positively to the wider neighborhood… The Monthly article. Wolf Creek Lodge Senior Cohousing Community, currently under construction in Grass Valley, CA, has been selected as the winner of the prestigious California State 2011 Governor’s Environmental and Economic Leadership Award for Sustainable Communities … Yubanet article. by J. M. Brown «» Walnut Commons is a proposed cohousing community that would include 19-21 private units in a three-story, green-certified building centered around a common living space, where neighbors would gather regularly for communal dinners, lectures, children’s activities and other programs. Professionals, artists, seniors and children are welcome… Santa Cruz Sentinel article. Is Folsom co-housing project blueprint for sustainable communities? by Seth Sandronsky «» Solar panels save energy, sure, but making a home truly eco-friendly depends a lot on location. Just ask Marty Maskall, project manager and future resident of Folsom EcoHousing, a 38-family, green-friendly community being planned 20 miles outside of Sacramento… Sacramento NewsReview. Energy efficiency … Passive solar heating … Passive cooling … Electricity use … Radiant heating … Solar hot water … Materials … Water use … Forestry … Air quality … Walkability … Minimum impact … Reduced driving … Landscaping… Wolf Creek Lodge website. …a community of 30 households located in Cotati, California, a small town roughly one hour north of San Francisco. Though we still have private lives, we’ve chosen to reside in this tightly knit neighborhood. We share 3-4 meals a week in our common house, which also provides laundry facilities and meeting space. We work together to maintain our lush landscape. We govern ourselves by consensus and resolve our conflicts through dialogue… Cotati Housing website. Cohousing California	 Links to various cohousing communities in California CalCoho.org.